Therese Greenwood fled the Fort McMurray wildfire two years ago with a small bag of important documents, an embroidered wall hanging and a coffee machine. Anticipating the worst, Greenwood had already packed an emergency bag and had taken the time to think about what needed saving most. During the panicked evacuation of the city in May 2016, few people had that luxury. “Your subconscious is working overtime,” Greenwood said in an interview with CBC Edmonton’s Radio Active. Greenwood has published a new book, chronicling her escape from the city. What you take with you: Wildfire, Family and the Road Home is a deeply personal account of the disaster. Greenwood said the book is also an examination of the personal artifacts people learn to cherish most in times of crisis. 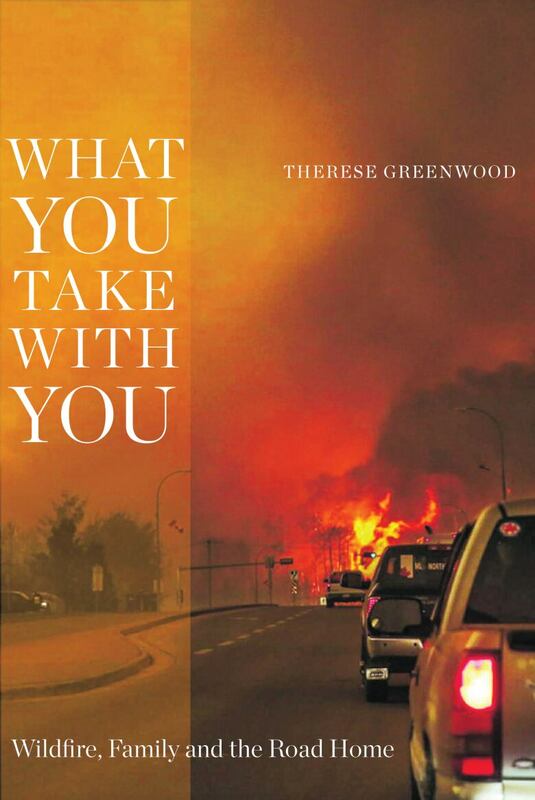 Greenwood — a crime fiction writer and former journalist — had been living in Fort McMurray for four years when the wildfire hit the city on that hot May afternoon and forced thousands to flee for their lives. As the flames approached, Greenwood had 15 minutes to pack before driving south to safety in Edmonton. “I was able to run out and throw my go bag right into the car and then spend the remaining 14 minutes running around,” Greenwood said. Her home was later completely gutted by the fire. She, like many others, dealt with the loss with a wry sense of humour. While Greenwood can laugh about it now, she was surprised to see how raw the memories still are for some in her home community. The memory of the catastrophe has been slow to fade for those who lived through it, she said. At Greenwood’s book launch in Edmonton last month, fellow evacuees in the crowd were overwhelmed with emotion. Greenwood said writing was cathartic. She hopes fellow evacuees can find solace in chronicling their own stories. She is hosting a series of free memoir-writing workshops in Fort McMurray to help others begin the process. “I hear from a lot of people that they really want to write about this but it’s really hard to sort through all the images,” she said.